With the international release of Booster Set 4: Eclipse of Illusionary Shadows today, many fighters are curious about the clan that has been called both one of the classically strongest and underplayed. Being one of the more recent of the current clans to be released, the Shadow Paladins are one of the first that we have had the opportunity of seeing unfold card-by-card. From the beginning this has made them easy to study and grasp as the clan has progressed, building the deck with the reveal of each new card. Unlike typical clans, the Shadow Paladins have very few cards that stand on their own. Instead each skill stacks incrementally, to form a united front. As the dark counterparts to the Royal Paladins, their ranks include the gods, spirits and demons of Great Britain from before the coming of Arthur, and those supplanted by Christendom. While the description of their strategy as embedded in the public eye is sacrificing one's allies for overwhelming power, the Shadow Paladin strategy is more accurately summarized as a replica deck. They take on multiple aspects and mechanics of other clans to form a supportive base for their retire skills. This goes hand in hand with their status as a terrorist revolutionary group--just as almost none of their members are related to one another outside of ideology, their skills are very disjointed and tie together in unexpected ways. Despite originating the basics behind many of today's top cards, ShadowPala lacks many of the modern conveniences associated with post-BT06 clans, and so can be very unforgiving to play. Virtually all Shadow Paladin decks will open with Fullbau, their only proper first vanguard at introduction. Fullbau is the originator of the modern Riviere-type evolving ride, although the Shadow Paladin brand of evolution provides no recompense if you miss the opening ride. When ridden over with the grade 1 Blaster Javelin, Fullbau's skill automatically adds Blaster Dark from the deck to the hand, and Javelin's own skill gives him +2000 additional power over a 6000 base for 8000 total. Because of this skill, it's possible to run Blaster Dark in as few as two copies in the deck, to ensure that so long as you get Javelin, you will get a one-card increase in advantage. Just these opening three cards are already considerably different from ShadowPala's Royal opposition, as no matter what Fullbau will not move to the rearguard. This protects from having an FV-based strategy locked down by countercards like Gattling Claw, and Javelin also provides four more grade 1 rides with base 8000 power. Considering that the majority of grade 1s have a 6000 base, and that moving first vanguards to behind the vanguard line is becoming increasingly less popular with the presence of custom boosters like Tron, this means that Javelin and the clan's base 8000 Black Sage, Charon provide a total of eight chances to deny the opponent the opportunity to deal early damage. While Fullbau puts increased pressure on the redraw to bring out Javelin, getting Javelin in the hand frees up your ability to play considerably, as much like Barcgal this brings you a grade 2 unit to ride and lets you try for extra grades 3 and 1 units rather than being focused toward assembling cards of every grade. The main weakness surrounding Fullbau is that he ties down the deck, and secondarily that if you miss the Javelin ride, he does not move out to the rearguard as with Riviere. The hard math of bringing out Javelin rests at around 56%, meaning that the odds of getting that one-card advantage are up to a coin flip that's been very slightly weighted towards heads. Because Fullbau requires you to run four copies of Blaster Javelin and two of Blaster Dark, including Fullbau means that a minimum seven cards of your deck have been taken over rather than just one. Running Blaster Javelin also provides incentive to run Phantom Blaster Dragon, and at the extreme end of things as many as thirteen cards may be chaining down what you can and can't run, hurting flexibility significantly. Fullbau's name follows a pattern specific to this Paladin variant. The -bau naming scheme of Shadow Paladin highdogs comes from the English onomatopoeia of a dog's bark, "bow wow" which may come from the sounds made by hunting dogs rather than domestic ones. Hence Fullbau is a "full bark." Of the clan's grade 1s, Witch of Nostrum, Arianrhod provides the best first turn outside of Javelin; by resting her, you can drop one card and draw another. Arianrhod is a unit that should be in every Shadow Paladin deck, as card changing is a very necessary part of their play because of how unforgiving mistakes can be in this clan. In Welsh myth she was the sister of Gwydion and Govanon, and mother of Llew ("fair-haired one.") Llew's birth caused her enormous humiliation to the court of king Math, and because of that over many years Arianrhod cursed Llew with three fates (tynged/Welsh equivalent to geis) which denied him the three fundamental aspects of masculinity--a name, weapons, and a wife. All three curses were eventually undone through Gwydion's trickery. Gururubau is an aggressive rearguard grade 1, gaining +2000 power when he attacks a vanguard, for a 9000 total. Like with Fullbau and Blaster Javelin, this is a fairly subtle skill. It allows Gururubau to attack any grade 1 opposition when taking the second turn, even units like Marron and Charon, before moving back to act as a boosting unit from grade 2 onwards. If these type of tactics were conducted with Charon, the opponent's immediate counter would be to attack Charon to deny the use of a powerful boosting unit, but Gururubau is only base 7000 and so his loss is not as devastating. Furthermore, Gururubau can form a base 16000 line with Charon, giving the deck greater flexibility late in a match. Unfortunately, there is not a great amount of room in the deck for him, due to Blaster Javelin taking up so much grade 1 space. Factoring in Mac Lir as the clan's perfect defense, with Arianrhod twelve cards have been taken up already, and most fighters would prioritize Charon over Gururubau. Gururu is an onomatopoeia in Japanese for a dog's growl, and Gururubau shares Fullbau's naming scheme. Hence, Gururubau is "growl and bark." The last of the grade 1s that we'll be discussing today is Doranbau, a base 6000 unit that when it boosts a "Blaster Dark," gives +4000 additional power for a 10000 total bonus. This is taken right from Wingal's playbook, but unlike Wingal, Doranbau can form a combo with Blaster Dark to make a 20000 power line. 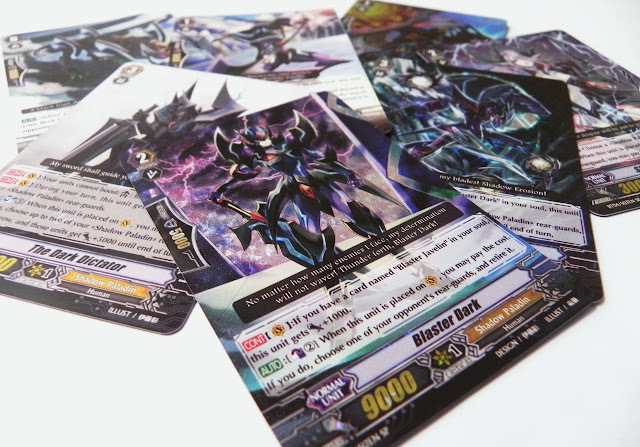 In the vanguard circle, Blaster Dark gains +1000 power over his 9000 base for having Blaster Javelin in the soul. Together these two units can retire almost all opposing rearguards, passing triggers onto your own rearguards to let them handle the matter of actually dealing damage. This also makes Doranbau a valuable counter to grade lock, and as he can form a 16000+ line with almost every grade 2 and 3 unit, he can handle Charon's job just as well. His main weakness is not forming those same lines with himself or any of the grade 1s, so Doranbau cannot entirely replace Charon; for this reason, he's best kept as a single copy to counter the occasional lock. Doran may be a reference to the mountain Beinn Dorain, or an intentional corruption of Dylan, Arianrhod's secondborn. Regardless of his name, the highdog is almost certainly based on the Welsh gwyllgi, ("wild/twilight dog") a mythical apparition of a black mastiff with blazing red eyes. Moving into the grade 2s, we've covered Blaster Dark's use with Fullbau through Javelin, and his increased power in the vanguard circle. On-ride, Dark can also counterblast 2 to retire any of the opponent's rearguards. While that retire skill is somewhat infrequent, it's important because it punishes the opponent for making multiple attacks and getting critical triggers, and it can disrupt strategies which involve their first vanguard. The skill also builds on the advantage from Fullbau, putting the opponent behind a card where Javelin put you forward one. Building an advantage throughout the opening of a match is critically important to the Shadow Paladin strategy. Small moves early in the game spiral out into vast disparities in advantage later on, so while Blaster Dark may not always hit, when his skill does it can become a key move very quickly. The counterblast may be better conserved for some of the rearguards to come, so being able to determine the flow of a fight and when the skill is vital to your victory may compel you not to use it even when it is available. Dark is a direct counterpart to Blaster Blade. Of note is that his character may have debuted as the first card ever available to the public, as the Blaster Blade promo card from KeroKero Ace has patterns engraved in his armor distinctly different from the BT01-era Blades, but identical to Dark's, and in accordance with his lore of not having the courage needed to activate Blade's sword, the promo card has no retire skill. Cursed Lancer is a unit that was very heavily advertised in the days leading up to BT04's original Japanese release, and as a promo card was actually the first Shadow Paladin that fighters could get their hands on. However, while his on-hit skill can be valuable in unflipping a small pool of damage for repeated use, like with Gururubau the deck is strained to find room for it. Grade 2 space in the Shadow Paladin deck is not as tight as grade 1 space, but even two copies of Blaster Dark leaves very little room when considering that the clan's base 10000 Rugos is very necessary due to the enforced use of stand triggers at their debut. Furthermore, running Blaster Dark in copies of four is common due to how he ties into grade 3 units later in the game. Darkness Maiden, Macha is another key to early advantage. With 8000 base power, when called or ridden she can counterblast 2 to superior call any grade 1 or lesser Shadow Paladin to her column. The steep counterblast calls for Lancer to be included immediately, but in BT04 she may not extend beyond a single copy like Doranbau. In the postcrossride era, Macha becomes invaluable for setting up base 18000 lines, as you can call her, superior call Charon behind her, intercept with her in the midgame before the opponent's crossride is set up, then call Rugos or a grade 3 as a replacement later on. Macha was a war goddess of Ireland, and while there were many variations on her, the daughter of Ernmas has the most resemblance to our Maiden. This Macha was one of three sister goddesses of war, the others being Badbhabh Caar and Nemain. Together the three of them instigated wars, and there was a particularly gruesome term "the mast of Macha," referring to the severed heads of slaughtered fighting men. In addition to Blaster Dark, the Skull Witch, Nemain is the secondary reason that grade 2 space is so tight for the Shadow Paladins. While she has only 3000 power, when called Nemain can counterblast 1 to drop one card and draw two. This builds advantage much more easily and at a much lower cost than Macha, and while Nemain can barely fight at all with Charon or Arianrhod's support, her initial use is as an extra 5000 shield for intercepting purposes as well as giving you greater access to the deck. This is one card that we will keep revisiting, as Nemain is probably among the best cards printed for the Shadow Paladins. In Irish myth she was a spirit of war, known for causing confusion among soldiers. She was treated as part of a trio of sister goddesses with Macha and Badhabh Caar, but the lineup of the trio changed frequently and Nemain's position was interchangeable with Morrigan and Anand. Like the Royal Paladins and Kagerou, ShadowPala has a special characteristic of having access to a second base 10000 grade 2, the Knight of Fighting Spirit, Dordona. While not a card that sees primary use at the moment, along with Rugos, this lets them form base 18000 lines in the postcrossride era and tie back to Macha to form a cohesive long-term strategy. Dordona is a misromanization of Dal Dauna, which in Irish myth is a corruption of Ildana, a nickname for Lugh. Lugh was the ancient High King of Ireland, whose mother was a Fomorian princess--the Fomorians were deities of chaos that inhabited Ireland in ancient times before the coming of the gods. Dal Dauna/Lugh would later kill the Fomorian king and his grandfather, Balor, by way of a prophecy that foretold Balor's demise. Additionally, Lugh's sword Fragarach was given to him by Manannán mac Lir, a god of the sea. Demon World Castle, DonnerSchlag is the Shadow Paladins' third base 10000, but comes with a difficult restriction. When he attacks, he gains +2000 power, which with Charon can form a 20000 line to pressure base 10000 units like Ezel and Garmore. However, if your vanguard is not Blaster Dark or Phantom Blaster Dragon, then his power drops down to 5000, which means that riding DonnerSchlag makes you virtually indefensible. Unfortunately, as it was already common to have neither of these units as the vanguard in the original release, and the international release of BT04 brings with it a new grade 3 that DonnerSchlag is equally incompatible with, the card is simply not that useful. DonnerSchlag seems to be German for "ThunderClap." While not from the set proper, Triple Dark Armor has drawn attention for being a promo card of close release. Like Macha he's a base 8000 unit, and so can only form a 16000 line with Charon, but when he attacks you can retire another Shadow Paladin rearguard to push that up to a 12000 base, for a much more consistent 20000 line than with DonnerSchlag. The case can be made that after BT05, once you've set up a Charon line with Macha, you can retire her for Dark Armor in fights where intercept is unlikely to be of use compared to simply dropping 10000 shield from the hand, but after serious testing I've concluded that running Rugos and Dordona is simply more consistent and gives you a stronger game throughout rather than pinning everything on the endgame. Getting into the grade 3s, the reason that we've been building up these small leads is because of the clan's boss card, Phantom Blaster Dragon. Blaster Dragon is a base 10000 unit that, if Blaster Dark is in the soul, has +1000 additional power on both fighter's turns, turning him into a base 11000 unit. Hence, you may want to run four copies of Blaster Dark to ensure that his continuous skill is consistent for defensive purposes. The main skill of Phantom Blaster Dragon is a counterblast 2, retire 3 to give him +10000 power and +1 critical. Since Blaster Dragon is a base 11000 to begin with, even the clan's draw trigger, Abyss Freezer, will bring that up to 26000 power, critical 2. When guarding for one trigger, that attack takes 25000 shield to stop, generally three or four cards. However, the price itself is steep, coming at one of the highest direct losses of advantage in the game. Your best ways of supporting the Blaster Dragon's skill are with Nemain and the grade 3 Dark Mage, Badhabh Caar. Caar's skill is to superior call the top card of the deck when called or ridden, as long as it's a Shadow Paladin. Even if that card is a trigger unit, it doesn't master to the Dragon, as it will only make him stronger. Since both Caar and Nemain partially negate the cost of retiring, they're both very valuable to a Shadow Paladin fighter. Probably the greatest criticism of the Dragon is that he takes three cards away but can be stopped with a perfect defense card like Flash Shield, Iseult or Diamond Ace, so no matter how the individual battle with him goes, it comes at a loss to his user. From this perspective, the best use of him is when the opponent doesn't have a perfect defense card in hand, but in a limit break-dominated format where these cards are run at four, that seems increasingly unlikely. There are several advantages to the skill, however, and this is where that small lead that we discussed becomes relevant. First, Blaster Dragon's skill can be used at just two damage, and can be used with Nemain at three. Unlike the majority of skills in the format today, he is not restrained by limit break and can pull out that extra critical from the moment that he is ridden. This means that a Shadow Paladin fighter can safely stay at two or three damage for the majority of the game and greatly weaken any late-game offense that the opponent mounts. Second, even when the opponent is not at five damage, extra defense can be dragged out of them. The Shadow Paladin deck before BT05 is reliant on enforced stand triggers, so most turns will see at least one rearguard attack mounted before the vanguard's battle phase. This can be exploited. By having Rugos attack an opponent's rearguard, even if he is unboosted, the opponent will have to either guard the rearguard or lose it. Regardless of what happens, the opponent will have lost at least one card, and even assuming that they drop a perfect defense card on Phantom Blaster, they will have lost three in the turn--just as many as the Shadow Paladin fighter has. The reason that the lead is needed before using his skill is that the goal of the cursed dragon's counterblast is in most cases not to decrease advantage, but to maintain the current one. An opponent who is at -3 cannot guard, call or ride as freely as they would at 0, and being at -3 versus -2 is a much worse situation than being at 0 versus 1. Even though the individual difference is only a single card, the overall loss drags them down to a position where that one card is much more important than it was before. And Phantom Blaster can do this in the same turn that he is ridden, potentially while at just two damage because Badabh Caar supports the skill just as well as Nemain does. This is what I call the Shadow Paladin's "divine move;" the best way to stop it is to take the extra damage and not lose two extra cards in the process, but that only brings the Shadow Paladin fighter closer to victory. The deck's winning image progresses by preserving the game state, a uniquely separate strategy from typical jousting matches. This is also why it is unwise for the opponent to attack Nemain. She is completely indefensible as a unit, and her main battlefield role is to intercept or to be sacrificed. The opponent is only getting rid of a unit that you were intending to eliminate from the start. Badhabh Caar is a somewhat difficult unit to use since he can call units to strange positions, for example putting Rugos in the back row or Charon in the front, creating an unfavorable formation. The best way to handle him is to have three open rearguard circles, in the event that another Caar, or Nemain is called. Units which do not need to kept can then be sacrificed to make room for the rest of your formation. In this way, the clan's divine move opens the field and leaves it somewhat more flexible because of this. This unrestrained field is one of the few points in which the deck is forgiving of poor plays. To work with Phantom Blaster, the grade 1 Blaster Javelin has a secondary skill, that when called to the rearguard he can discard a grade 3 Shadow Paladin to add Phantom Blaster Dragon to the hand. This is important because it means that any grade 3 in the deck can become Phantom Blaster--on the turns leading up to your grade 3 ride, any combination of Javelin and one of your grade 3s can become the cursed dragon. In this way, you can run as many as six to eight of the Blaster Dragon, adding a defensive fallback and consistent way to bring out an extra critical. In some situations it can even be recommended to drop the Dragon to add another copy to the hand, as that removes nontrigger units from the deck and increases the probability of a trigger being checked. There is no single mythological figure that Phantom Blaster seems to equate to. However, he may be a general stand-in for the numerous leaders of the Fomorians in Irish myth. His status as the leader of a group which primarily draws from Irish myth, and his use of a polearm related to bloodshed and battlelust connects him to Lugh. Meanwhile, Badhabh Caar (pronounced as "Baib Car" and also spelled Badb or Badhabh Catha, meaning "battle crow") was an Irish war goddess who took the form of a crow. Caar would often take sides in wartime and cause fear and confusion among the side that she wished to lose. In addition to Badhabh Caar, the Shadow Paladins also have offensive rearguard support from Silver Spear Demon, Gusion. For a counterblast 2, he gains +4000 power, applying heavy pressure to opponents with support from Arianrhod. Effectively, Gusion is a ShadowPala reprint of Genocide Joker. While Joker was immensely useful at his introduction for the Nova Grapplers, who have access to many unflipping skills from Claydoll Mechanic, Storm, Gold Rutile and Hungry Dumpty, a deck which uses Gusion is entirely reliant on Cursed Lancer to repeat his skill. Since this is a relatively low impact for its cost, Gusion is difficult to recommend versus his contemporary grade 3s. The Spear Demon is the odd man out, as Gusion is a Great Duke of Hell from the Lesser Key of Solomon, ruling over forty legions of demons. Origin Mage, Ildona is the clan limit breaker, introduced in Extra Booster 3: Cavalry of Black Steel rather than in BT04 proper. Initially, he gains +3000 power when attacking a vanguard, but at limit break 4 he can counterblast 2 to retire two Shadow Paladin rearguards, draw two cards and then gain +3000 more power. This forms a very easy 23000+ line with boosting units of base 7000 and above, letting him hit crossrides for very dangerous numbers while cycling out unneeded rearguards. Ildona may not directly increase advantage, but with Nemain and Badhabh Caar he can preserve the new advantages gained from their skills and act as a defensive wall while also pressuring all varieties of vanguard units, functionally acting as a Tsukuyomi for the Shadow Paladins. With all these units sifting through the deck however, Ildona shares the Goddess of the Full Moon's danger of decking out, as he can hold out practically forever while the deck itself is a finite resource. Ildona is a misromanization of Ildana, a nickname for Lugh meaning "skilled in many arts." The arts here refer to armaments or weapons, hence his "long arms." While not as prominent as Phantom Blaster, Dark Metal Dragon is the original standard for a Shadow Paladin vanguard. His skill is to gain +2000 power whenever he drive checks a Shadow Paladin, but recall that as a grade 3, this takes place twice with the twin drive for a +4000 total. With either Arianrhod or Charon, Dark Metal rises up to break the 21000+ line, forcing heavy pressure on both base 10000 and 11000 vanguards. While this was once the default vanguard run at four copies with Phantom Blaster as a finishing maneuver, Dark Metal has been severely displaced by two factors; first, BT05 introduces base 13000 units, and with no 9000 booster Dark Metal's power is capped at 22000, 1000 power short of the mark for taking out more than 10000 shield. The second is the introduction of The Dark Dictator. In his original release, The Dark Dictator was a promo card exclusive to the manga and released after both BT05 and EB03 gave the Shadow Paladins additional support, but in the English pro scene Dictator is being introduced into an environment that was not designed to for his use. This creates a difficult problem for Shadow Paladin cardfighters; The Dark Dictator's skills are too powerful not to use, but the Shadow Paladin deck at the time of BT04 was designed primarily with Dark Metal Dragon and Phantom Blaster in mind. Much like the soulless OraThin deck and Garmore, Dictator himself is an anticrossride vanguard, but he has been brought into an environment that will not have crossrides until February. Dictator's two continuous skills simultaneously prevent him from being boosted, and give him +2000 power for every Shadow Paladin rearguard on your own field. By themselves, these skills establish that he cannot replace Dark Metal. This is because The Dark cannot break 21000, hurting his effectiveness versus base 11000 vanguards. One solution to the problem is to create a trade-off, using Dark Metal until BT05 and then switching him in with Dictator as the new The End anticard, but his third skill does away with that. On-ride, The Dark can soulblast 3 to give +5000 power to two front row Shadow Paladins, providing a completely opposite strategy from Phantom Blaster by suddenly charging the entire field up to fight with at least 20-21000 power. In a crossride format Dictator can work with Rugos/Dordona and Charon for base 23000 lines while requiring no booster of his own to reach 18000 thanks to the fifth Marron principle, and in our current one he can completely overwhelm contemporary units regardless of their base power. If the opponent is already at five damage, then a single turn of this skill is very close to impossible to survive--the most optimal defense that the opponent can muster will involve the loss of six cards, and with the stand triggers enforced by the Shadow Paladins of this era, a unit that has already attacked will still have the extra power from Dictator on it, making for a second base 20000 attack with Rugos. Contrary to his anticrossride use in the February-on format, The Dark Dictator is a Garmore killer in the present one. He provides an interesting challenge. Shadow Paladin cardfighters have to decide between Dictator's overwhelming rearguard support, and Dark Metal Dragon striking both the base 10000 units that The Dark can as well as the 11000 units that he can't. How this will be confronted is still an open question, and one that each fighter will have to answer individually. There are several things to keep in mind, however; the Shadow Paladins have no soul support until BT05, so the skill will generally only go off once in a game, and care needs to be taken not to blast Blaster Dark from the soul, or otherwise subsequent rides of Phantom Blaster Dragon will lack an 11000 base to work off of. In addition to what we've covered so far, there are several advanced ways to make use of The Dark Dictator. With Arianrhod behind him you can use her card change to sift through the deck, but you can also call Nemain behind him to gain a one-card increase without harming the field in the slightest, and preparing for an eventual Phantom Blaster Dragon ride depending on how the game has flowed so far. The Dark Dictator seems to be based off of Mordred, just as Alfred is based off of Arthur. Both figures are responsible for carrying out plots for their opponents' destruction, although Mordred is a much more tragic figure who is compelled by destiny instead of desire. Rather than being Alfred's nephew or son as with Mordred, The Dark is a shadowy other, but like Mordred he declares himself the one and only king in Alfred's absence and seeks to slay his counterpart. Fifteen pros use this clan.